A single cell can contain a wealth of information about the health of an individual. Now, a new method developed at MIT and National Chiao Tung University could make it possible to capture and analyze individual cells from a small sample of blood, potentially leading to very low-cost diagnostic systems that could be used almost anywhere. The new system, based on specially treated sheets of graphene oxide, could ultimately lead to a variety of simple devices that could be produced for as little as $5 apiece and perform a variety of sensitive diagnostic tests even in places far from typical medical facilities. The material used in this research is an oxidized version of the two-dimensional form of pure carbon known as graphene, which has been the subject of widespread research for over a decade because of its unique mechanical and electrical characteristics. The key to the new process is heating the graphene oxide at relatively mild temperatures. This low-temperature annealing, as it is known, makes it possible to bond particular compounds to the material's surface. These compounds in turn select and bond with specific molecules of interest, including DNA and proteins, or even whole cells. Once captured, those molecules or cells can then be subjected to a variety of tests. The findings are reported in the journal ACS Nano in a paper co-authored by Neelkanth Bardhan, an MIT postdoc, and Priyank Kumar PhD '15, now a postdoc at ETH Zurich; Angela Belcher, the James Mason Crafts Professor in biological engineering and materials science and engineering at MIT and a member of the Koch Institute for Integrative Cancer Research; Jeffrey Grossman, the Morton and Claire Goulder and Family Professor in Environmental Systems at MIT; Hidde L. Ploegh, a professor of biology and member of the Whitehead Institute for Biomedical Research; Guan-Yu Chen, an assistant professor in biomedical engineering at National Chiao Tung University in Taiwan; and Zeyang Li, a doctoral student at the Whitehead Institute. Other researchers have been trying to develop diagnostic systems using a graphene oxide substrate to capture specific cells or molecules, but these approaches used just the raw, untreated material. Despite a decade of research, other attempts to improve such devices' efficiency have relied on external modifications, such as surface patterning through lithographic fabrication techniques, or adding microfluidic channels, which add to the cost and complexity. The new finding offers a mass-producible, low-cost approach to achieving such improvements in efficiency. The heating process changes the material's surface properties, causing oxygen atoms to cluster together, leaving spaces of bare graphene between them. This makes it relatively easy to attach other chemicals to the surface, which can interact with specific molecules of interest. The new research demonstrates how that basic process could potentially enable a suite of low-cost diagnostic systems, for example for cancer screening or treatment follow-up. For this proof-of-concept test, the team used molecules that can quickly and efficiently capture specific immune cells that are markers for certain cancers. They were able to demonstrate that their treated graphene oxide surfaces were almost twice as effective at capturing such cells from whole blood, compared to devices fabricated using ordinary, untreated graphene oxide, says Bardhan, the paper's lead author. The system has other advantages as well, Bardhan says. It allows for rapid capture and assessment of cells or biomolecules under ambient conditions within about 10 minutes and without the need for refrigeration of samples or incubators for precise temperature control. And the whole system is compatible with existing large-scale manufacturing methods, making it possible to produce diagnostic devices for less than $5 apiece, the team estimates. Such devices could be used in point-of-care testing or resource-constrained settings. Existing methods for treating graphene oxide to allow functionalization of the surface require high temperature treatments or the use of harsh chemicals, but the new system, which the group has patented, requires no chemical pretreatment and an annealing temperature of just 50 to 80 degrees Celsius (122 to 176 F). While the team's basic processing method could make possible a wide variety of applications, including solar cells and light-emitting devices, for this work the researchers focused on improving the efficiency of capturing cells and biomolecules that can then be subjected to a suite of tests. They did this by enzymatically coating the treated graphene oxide surface with peptides called nanobodies -- subunits of antibodies, which can be cheaply and easily produced in large quantities in bioreactors and are highly selective for particular biomolecules. The researchers found that increasing the annealing time steadily increased the efficiency of cell capture: After nine days of annealing, the efficiency of capturing cells from whole blood went from 54 percent, for untreated graphene oxide, to 92 percent for the treated material. The team then performed molecular dynamics simulations to understand the fundamental changes in the reactivity of the graphene oxide base material. The simulation results, which the team also verified experimentally, suggested that upon annealing, the relative fraction of one type of oxygen (carbonyl) increases at the expense of the other types of oxygen functional groups (epoxy and hydroxyl) as a result of the oxygen clustering. 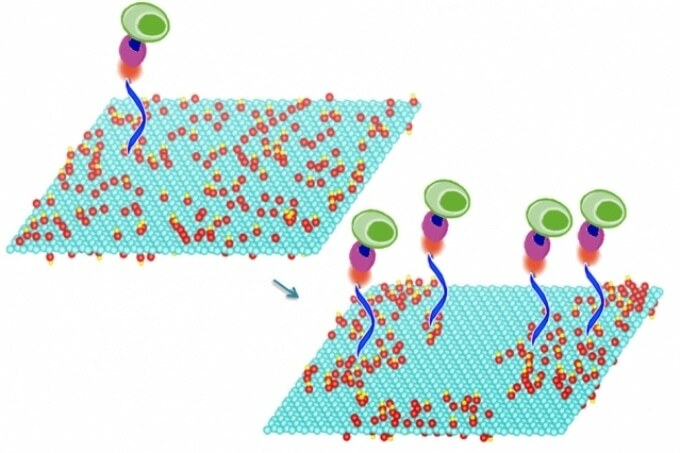 This change makes the material more reactive, which explains the higher density of cell capture agents and increased efficiency of cell capture. "Efficiency is especially important if you're trying to detect a rare event," Belcher says. "The goal of this was to show a high efficiency of capture." The next step after this basic proof of concept, she says, is to try to make a working detector for a specific disease model. In principle, Bardhan says, many different tests could be incorporated on a single device, all of which could be placed on a small glass slide like those used for microscopy.